« Even more “Never a Year” pics! Not everyone may know that many of the artists and programmers at JibJab also work for us as models. Sounds glitzy, right? Our good looks are undeniable. 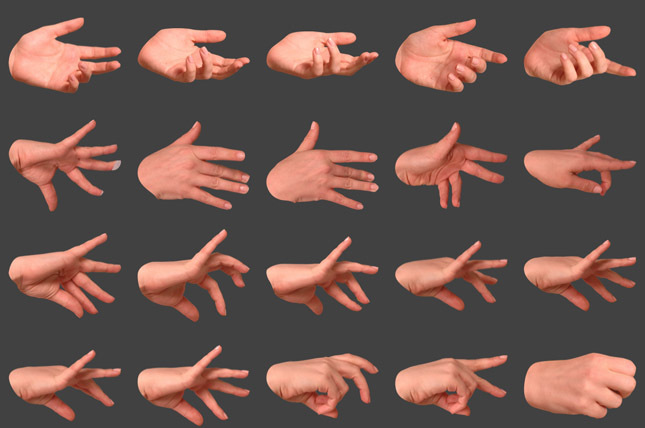 We often nab people while they’re working at their desks for a quick photoshoot to fill out the assets we need for animating, and one of the biggest needs we have is for hand images. We try to keep a stockpile of hand poses that can suit any activity we want to convey, and the human hand sure can take on many shapes and forms. Our modeling sessions have hands pressing up against objects, wrapped around tools and photographed from every angle until we have hundreds of variations. Good reasoning to keep our nails properly manicured! Amanda from our animation team deserves a hand for all of the modeling done above. Check out some of our hands in use over in the freshly updated Profile Pics area! This entry was written by paulhanges and posted on January 6, 2010 at 6:34 pm and filed under Inside JibJab. Bookmark the permalink. Follow any comments here with the RSS feed for this post. Trackbacks are closed, but you can post a comment. are these all the new gang signs?